Organizing 4 U provides expertise for Home Offices, Businesses and Residences in the greater Cleveland area. 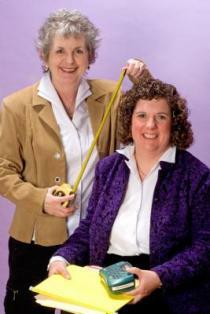 Muffy Kaesberg and JoEllen Salkin founded Organizing 4 U in 2003. As the only Professional Organizing team in Ohio, they quickly assist individuals who are overwhelmed by clutter in their homes and offices by providing hands-on organizing, and transferring skills to make life simple. If you spend precious time every day searching for lost things, the Organizing 4 U team can help. They will design a system to enable you to find things when you need them. In the process, you will also find up to two weeks of time that you previously spent searching for those lost things. The Organizing 4 U team has provided expert advice for Ladies’ Home Journal, the Cleveland Plain Dealer and Sun Newspapers. They have also appeared on local television shows in the Cleveland, Ohio area. To learn more about the Organizing 4 U team, and what they can do for you, visit their web site at Organizing 4 U.